I'm enabling posting on the blog. That means that if you want to leave a comment to our folks down in MS, you can. We'll see how that goes! They might have Internet access at Stennis (it's a friggin' space center!). They're at Stennis Space Center which is real close to Lakeshore on the Mississippi Coast. That's where the hurricane directly hit. 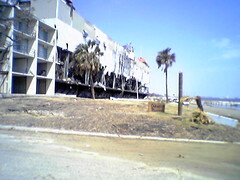 Gonzo painted a picture of worsening devastation as they traveled towards the coast. A few broken trees in cities they initially passed through soon transitioned into arboreal destruction whilst moving south. These trees completely destroyed the homes around them. One person Gonzo talked to said that three out every four homes was destroyed. And this was before the team arrived where the worst of the damage was. Gonzo says they will be staging out of Stennis NASA Base by Gulfport. Gonzo left a message yesterday saying they had arrived in Mississippi. Today they start the real work. He isn't sure what the work will be. There is a chance that they will be relieving local firefighters on the trucks, giving them a chance to spend some time at home with their families. Now, that would be pretty cool. There is also a good update from our Assistant Chief on your city e-mail account. There are now 10 city firefighters deployed in the gulf area. I have not listed their names, because I'm not so sure I would want everyone in the world knowing that I was going to be away from my home for a month (sorry Gonzo and Brian). Brian called the station today to tell us that they will be deploying tomorrow at 6 a.m. for Jackson Misssissippi. They were told that there will be no power and no utilities where they are deploying. They are bringing a week's worth of water with them. It's about an 8 hour drive from Atlanta to Jackson. They have been told they will be part of a "recovery effort," with no further explanation. There is no cel phone service, but Brian is going to be making attempts to keep us posted. Thanks to Don Waller for this! Bill says that they are still in Atlanta, but finished with their FEMA classes. Our 6 guys have been paired up with two guys from Maple Valley to form a team of 8. There are a lot of firefighters from the NW waiting to be assigned. They've been given shots, credit cards and FEMA IDs. They'll get their T-Shirts when they are deployed. They have to sit in a waiting room for a 2 hour shift to see if their team is called up. When they are called up, they will be going to a relocation center for displaced Gulf vicitms. It could be anywhere - New Orleans, Baton Rouge, Portland - Oregon. You name it. Bill says they are pretty comfortable and are glad to be through the FEMA classes! Bill says he will update us as things develop. 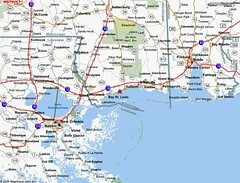 Six members of the SFD are headed to Atlanta (their first stop) to help with the Katrina Disaster. We'll keep you posted at to what they're up to.